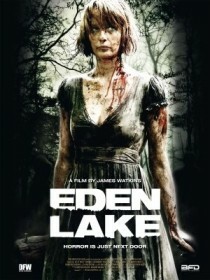 A frightening thriller, Eden Lake gets under your skin and leaves you feeling exhilarated as well as angry. Its rendition of characters from certain English walks of life is very realistic, feeding our fears of a society breaking down. The film is violent, at some moments crossing into the Horror genre. There are one or two scenes where the actions of characters are unrealistically extreme. But this we forgive because overall this is a great film. You can find more information on this British movie on Wikipedia and IMDb. Ignore the IMDb user rating; this film deserves a higher score.